The Egyptian Goose was at Picnic site No.1 today, also seen were a male Red-crested Pochard, two Teal, five Soveler, one Common Sandpiper, one Peregrine and two Hobbies. Single Red-crested Pochard (Heron's Green Bay), Barn Owl and Yellow-legged Gull were seen today, along with at least two (possibly up to four) Hobbies. The appearance of fully-grown juvenile Little Grebe and Great Crested Grebe seems to be the result of birds bred elsewhere; whether any manage to breed at Chew this year remains to be seen. Also seen today were four Ravens, and singles of Common Tern, Yellow-legged Gull, Hobby, Peregrine and Nuthatch. A male Red-crested Pochard was seen in Stratford Bay this afternoon; also around the lake were a male Tufted Duck x Pochard, five Teal, three Shoveler, four Spotted Flycatchers (a family group of three at Hollow Brook and one at No.2 picnic site), and one Cuckoo. Over 400 Canada Geese have accumulated to moult at the lake, and there has been a substantial increase in the number of immature Lesser Black-backed Gulls at Herriott's Pool. Two Barn Owls were showing well at Heron's Green Pool, also of note were a Hobby, and a brood of six Tufted Ducks at Nunnery Point. A Red Kite was seen over Moreton Cottage this evening. A pair of Egyptian Geese were seen at Heron's Green Pool today. The female Goldeneye was still at Stratford Islands today but unfortunately there was no sign of the chick (it was still there yesterday). Also a Hobby and two Yellow-legged Gulls. An extraordinary day. Following continued overnight winds, yesterday's Storm Petrel influx reached Blagdon this morning with two off Rainbow Point; the second site record, and the first there since the fabled September 1983 storms. Three more were then located at Chew, at times extremely difficult to find at long range when they sat on the water. There have been four previous accepted records at Chew (seven birds, including a flock of three in October 2000). In addition, observers at Severn Beach this morning also saw a summer plumage Sabine's Gull. More photos to follow on my other site (all from Severn Beach). More photos and some video links at Severnside Birds. 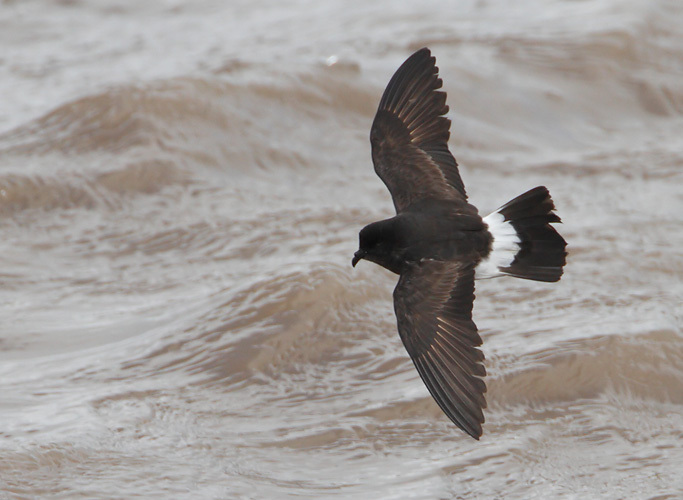 A day of very unseasonal SW gales which saw the estuary battered with Storm Petrels and Pomarine Skuas, but at Chew we just had to make do with the usual blizzard of Swifts. Remarkably there were two reports of Swifts found ditched in the lake; quite how either bird ended up in the water is unknown, although the fate of one of them was recorded - it was swallowed whole by a Great Black-backed Gull. I've never heard of such an occurrence at Chew before (or anywhere, come to think of it); for it to happen twice within a few hours is peculiar to say the least. Another Red Kite was seen today, flying north over Heron's Green Bay. Also, on the lake was the male Garganey (Herriott's Pool), the baby Goldeneye, a Common Tern, and an increase in the last few days in Gadwall and Pochard numbers, as birds arrive to moult. The Goldeneye chick was still with its mum around Stratford Islands today. Also seen were five Black-tailed Godwits, a Common Tern, and Oystercatcher and a big number of Swifts and hirundines, feeding over the lake in the unpleasant weather. A female Goldeneye with a small chick was seen in Stratford Bay this afternoon - it's the second breeding record for Chew. The previous brood was found in 2008, also on June 4th, which at the time was thought to be the first English breeding record of a wild Goldeneye. Eight Common Terns were present off Nunnery Point, and a Barn Owl was showing well at Heron's Green Pool this afternoon.